William Alexander Smith born on 27th October, 1854 at Pennyland near Thurso, on the stormy north-east coast of Scotland. His father and his grandfather before him had been officers in the Army. When young William came south to Glasgow at the age of nearly fifteen it was to begin work as clerk in his uncle fraser’s soft goods business. 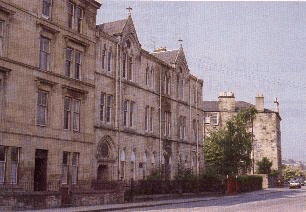 While he was still in his teens he enrolled in the Lanarkshire Rifle Volunteers, and a year later he became a member of the Free College Church, near his uncle’s and aunt’s home in the fashionable west end of the city. Young William filled every hour of every day of the week with work, drill parade, and church meetings. Indeed his uncle grumbled a bit about his enthusiasm for soldiering, and complained that he was never at home. In those martial and imperial days it was customary for young men of spirit to join the Volunteers. After all, the British Army fought more than a hundred wars and frontier engagements throughout the Empire in those years of ‘Hope and Glory’. William Smith was tall, manly and military in bearing, and it was natural that he should want to follow in his father’s and grandfather’s footsteps. His other main interest was with some of his friends in the YMCA. And it may be noted in passing that by the time he was eighteen he was already friendly with the girl who was later to be his wife. BB begin at North Woodside Mission Hall. The minister of the Free college Church was the Reverend George Reith (Father of the Lord Reith who became the first Director-General of the BBC). William Smith became a teacher in the Sabbath School which was held in a mission hall in North Woodside Road, not far from the church. It was in the Sabbath School that he struck a snag, and had an idea. The snag was that the older boys were bored and restless. No one seemed able to interest or control them. They felt that they were too old for the Sabbath School and they were suspicious of ‘do-gooders’ and teachers who told them to sit still, make less noise, and generally behave themselves. In short, they were typical healthy teenagers. Smith thought a lot about it. On a Saturday afternoon, as an enthusiastic young officer in the Volunteers, he had no difficulty in making a hundred men obey his every word and command on the nearby drill ground. Yet on a Sunday he could do nothing with a small group of lively boys. It was then that he had his idea: ‘Drill and Discipline’. Why not turn his Sabbath School boys into a volunteer band or brigade, with the same military order, obedience, discipline and self-respect as any well trained corps of the Army of the Queen? Religious instruction was the core of the Sabbath School work. But why should the boys not enjoy games as well as discipline, gymnastics and sport as well as hymns and prayers? William Smith discussed his idea with two of his close friends in the YMCA, the brothers James R. Hill and John B. Hill who taught in the Sabbath School with him and who were fellow Volunteers. Nothing was left to chance. The programme was talked out with care for every detail and, with the plans made, they asked God’s blessing on it. Later, William Smith was to sum up his aims in these words. The aim was to devise something that would appeal to a boy on the heroic side of his nature- something that would let him see that in the service of God there is as much scope for all that is brave and true and manly as in the service of King and Country. On 4th October 1883 the three leaders invited the boys of North Woodside Mission Sabbath School to join The Boys’ Brigade. The badge was to be an anchor and the motto ‘Sure and Stedfast’. William Smith took the words and the spelling and the crest from the Authorized Version of the Epistle to the Hebrews, chapter 6, verse 19: ‘Which hope we have as an anchor of the soul, both sure and stedfast’. Name and badge and motto remain through the hundred years since that momentous day. The advancement of Christ’s Kingdom among boys and the promotion of habits of Reverence, Discipline, Self-Respect, and all that tends towards a true Christian Manliness. (The word obedience was added some 10 years later). It was typical of William Smith’s serious purpose, and true to the spirit of the times, that he put down all the important words with a capital letter. Throughout its history, the most important person in the B.B, has always been the boy. As yet there was no uniform, but the leaders wore a small red rosette in their lapels. Fifty-nine boys volunteered to join right away, some out of curiosity, others ready to see what fun they could make of the new idea. All of them were between the age of 12 and 16. When they learned that ‘discipline’ meant what was said, the number of recruits dropped to 35. From the very beginning William Smith was as strict with his Boys as the army had taught him to be with himself and his Volunteers. One of the first rules was that no boy was allowed to ‘fall in’ if he were even a minute late on parade at eight o’clock, and another made it clear that ‘no member was allowed to miss two drills running’. blacksmiths, clerks, or engine fitters. No doubt they had to work long hours, even on a Saturday night, but Smith noted with pride that they were keen enough to turn up for Bible Class at 9.30 a.m. prompt on a Sunday, with or without breakfast. The year 1883 closed with an examination for promotion among the boys. After careful consideration of drill, written work, conduct and character, two sergeants, two corporals and two lance-corporals were appointed, and the Company was divided under them into six squads. The 1st Glasgow Company of the Boys’ Brigade was well and truly established. The above is part of the HTML version of “First for Boys”. Created by the Officers and Boys of the 1st Ashton-In-Makerfield Company and a full copy is available on the BB UK site. The copyright in the book itself is held by The Boys’ Brigade, all rights reserved.